To borrow a phrase from the Grateful Dead song “Truckin,’” what a long, strange trip it’s been for guitarist Stanley Jordan, who performs solo shows at the Arts Garage in Delray Beach on April 5 and 6. Now 59 years old, the Chicago-born Jordan became a rarity — a jazz superstar — while in his mid-20s as a result of his 1985 album Magic Touch. Released on the Blue Note recording label, its title referred to his incredible, two-handed, “touch” technique of tapping the guitar’s fretboard, as opposed to the standard strumming of the strings with a pick or his fingers. The disc featured mostly covers (from The Beatles’ “Eleanor Rigby” to Thelonious Monk’s “‘Round Midnight”) and unaccompanied solo performances. Inspired by Jordan’s childhood classical studies on piano, an instrument he still plays, and accomplished via alternate tuning on a six-string guitar customized by French luthier Patrice Vigier, Magic Touch touched both ardent and casual jazz fans — and beyond. It earned multiple Grammy nominations, stayed at No. 1 on the Billboard jazz chart for 51 weeks, was certified gold, and inspired music videos, which were even more unheard of within jazz in 1985 than now. All aided by Bruce Lundvall (1935-2015), label head of imprints like Elektra/Musician, Blue Note, and EMI Manhattan, who offered Jordan a recording contract on the spot after his audition. “I had a strategy for success within the music industry,” Jordan says by phone from his home office in late February. “It just worked way better than I expected. Because there were some elements that I’d never envisioned. Bruce was head of Elektra/Musician when I auditioned, but I knew from the experience of recording my independent releases that the label had a limited budget. So I didn’t sign right away, although I knew Bruce was the guy I wanted to work with. “Eventually I went in to sign a deal with him, and that ended up being just as he’d gotten a call from Capitol Industries, saying they wanted him to head up Blue Note and the pop label EMI Manhattan, to get a bigger presence on the East Coast. So when I released ‘Magic Touch,’ the Blue Note and EMI Manhattan staffs were both promoting it. All of it went beyond my wildest dreams,” he said. But almost as quickly as he rose to stardom, Jordan retreated from it. Adept at classical and rock music as well as jazz, and feeling he wasn’t taken seriously enough as a composer, he completed his contract on Blue Note with lesser-selling albums of mostly live material, jazz standards, and other covers. Jordan also moved from the northeastern United States, where he’d studied computer music and theory at Princeton University in New Jersey, to the picturesque and comparatively unpopulated Sedona, Ariz., where he still resides, in 1995. From 1994 through 2008, when he released the Sedona-inspired State of Nature on Mack Avenue Records, Jordan even completely eschewed recording labels in favor of website-only releases like the therapeutic Relaxing Music for Difficult Situations and the Middle Eastern-themed Ragas. His latest release is Duets (2015) with fellow guitarist Kevin Eubanks; his latest credit is on Music From Our Soul (2017), by bassist and longtime touring partner Charnett Moffett. Jordan’s next recording, already completed, will be Feather in the Wind. His last in a four-CD contract with Mack Avenue, it will be released on a different and as yet-undetermined label, major or independent, because of the contract’s option clause. “It’ll definitely be out this year,” Jordan says. “Mack Avenue owns it, but opted out because they didn’t really think it fit the format of the label. It’s about coping with change and loss, and maintaining continuity. There are a few different ensembles, and it’s more full band than solo performances. I released a 2011 album called ‘Friends,’ and this one is kind of like that because I had some some guest artists on both. “On this one, some of them are T.M Stevens on bass, Kenwood Dennard on drums, and keyboardist Delmar Brown on some of the last recordings he did before he died, plus my Brazilian rhythm section of bassist Dudu Lima and drummer Ivan Conte on those kinds of tracks. But ‘Friends’ was more about specifically featuring the guest artists than this one is,” he said. Jordan isn’t the first or last guitarist to employ any of these techniques, yet no one quite utilizes them like he does. Late British fusion icon Allan Holdsworth primarily used his left fretting hand to achieve similar legato results; Eddie Van Halen rose to stardom with his self-titled band as the best of a legion of tapping rock artists, and former Frank Zappa band member Mike Keneally, as great a keyboard player as guitarist, occasionally plays both instruments simultaneously onstage. Jordan’s star has also risen in recent years within the jam band circuit, including sit-ins with groups like the post-Grateful Dead act Phil Lesh and Friends and the Dave Matthews Band. Guitarists worldwide marvel at Jordan’s technique, taste, and facility, including some based in South Florida who also think outside the standard electric six-string box. 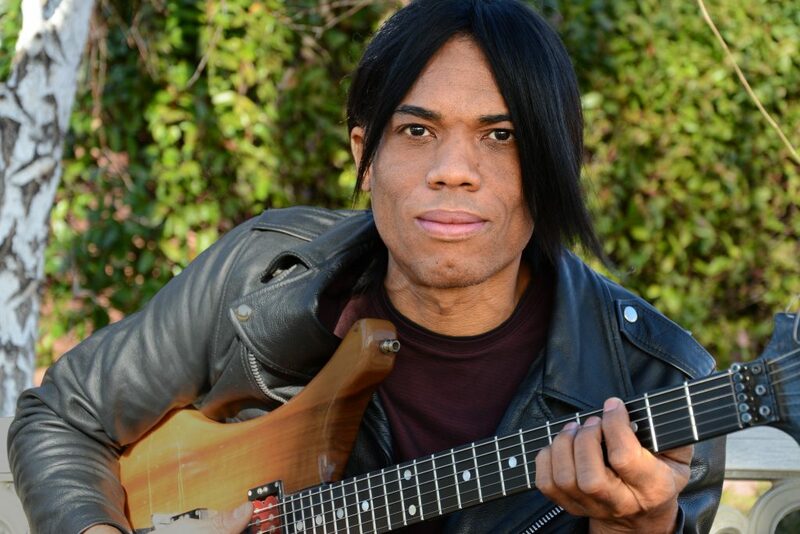 “Stanley Jordan is one of those rare musicians like George Van Eps, Lenny Breau, Phil deGruy, and Charlie Hunter who has re-invented the guitar and created an entirely new language of expression,” says Tom Lippincott, a Hollywood-based, Conklin eight-string electric guitarist who finger-picks jazz in settings from solo to trio to orchestral. The soft-spoken Jordan sometimes appears to be the one least impressed with his otherworldly pianistic approach to the guitar. Since his move to Arizona nearly a quarter-century ago, he’s focused on giving back to music as a teacher, a student of musical therapy at Arizona State University, and even a book-and-musical-instrument store owner in Sedona from 2005-2008. Like many successful jazz artists, Jordan has built even more of a reputation internationally than domestically through his touring abroad. Now a fan favorite in Brazil (where he tours with Lima and Conte), he appears to have finally found a peaceful coexistence between being a musical artist and a musical businessman after his early success, having endured the pitfalls and learned the lessons that went with them. See Stanley Jordan at 8 p.m. on April 5 and 6 at the Arts Garage, 94 N.E. 2nd Ave., Delray Beach ($45-$55, 561-450-6357 or artsgarage.org).